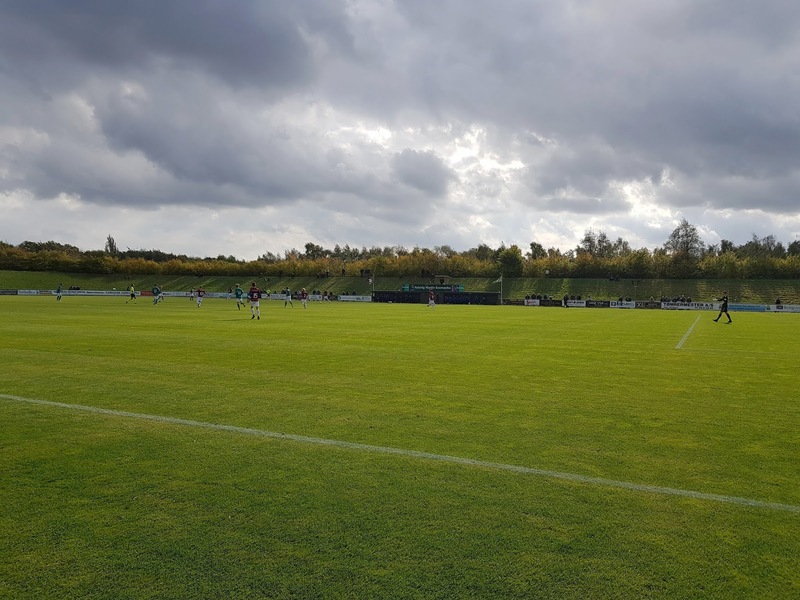 My twenty-fifth ground of 2018 was on Sunday 30th September at Espelundens Idrætsanlæg in Rødovre, Hovedstaden, Denmark. The match was Avarta vs. Frem in the Danish 2. Division. Located just to the west of the Copenhagen city boundary the ground is in an area of green space in between a motorway to the west and an industrial estate to the east. There are a couple of artificial pitches to the north and a camp site to the south. The ground is three-quarters of a mile north of Brøndbyøster railway station which is part of the B-Line on the Copenhagen S-Train network. 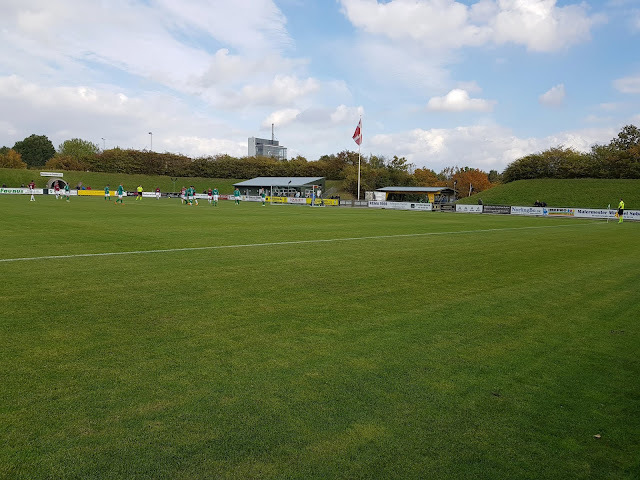 The club were formed in 1953 and initially played at the Rødovre Stadium before moving to their current home at Espelundens Idrætsanlæg in 1960. The entrance to the ground is from the east. This end behind the goal has a wide area of uncovered concrete with a building in the north-east corner holding a food outlet and the toilets. To the left of the entrance is the start of a steep grass bank which continues round the western and southern ends of the ground creating a natural bowl which finishes in the north-west corner. A good number of spectators use this banking to watch the game from as it provides excellent high views. 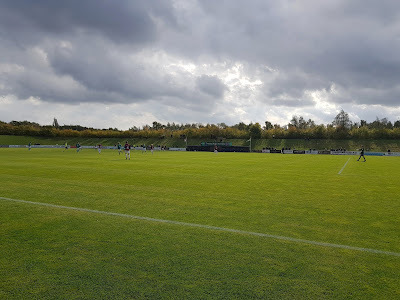 The southern side of the field has hard standing at ground level and in the middle a wooden dugout structure with a filming gantry on top of it. 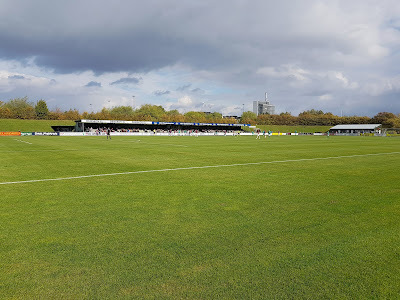 The western end similarly has hard standing at ground level but there is also a food outlet in the south-west corner with half a dozen picnic benches in front. 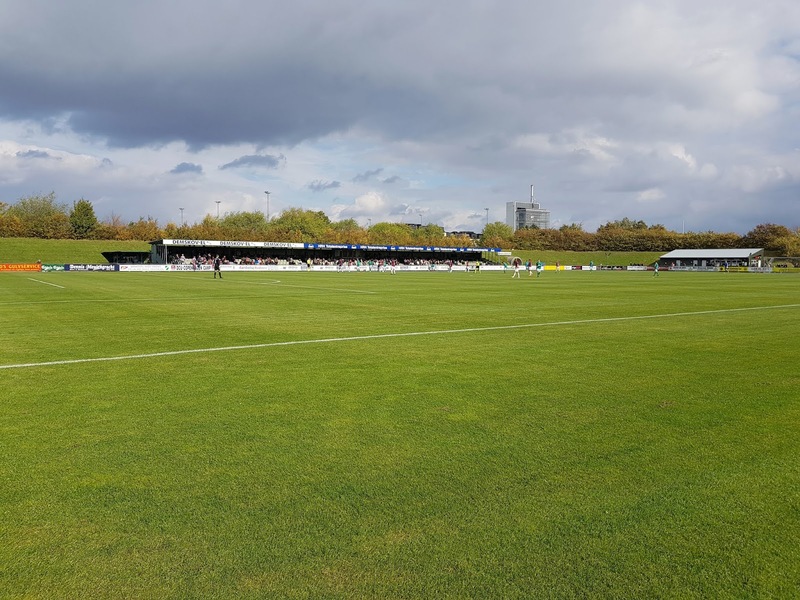 The only stand at the venue is a 471 seat structure which runs for most of the northern side of the ground. The remaining sections either side of this are uncovered hard standing. The back of the stand has a box in the middle for the club announcer to reside from. Unusually the players emerge into the arena to the east of the stand via a tunnel which resembles a large drainpipe. This feeds through from an adjacent site which houses the dressing rooms. 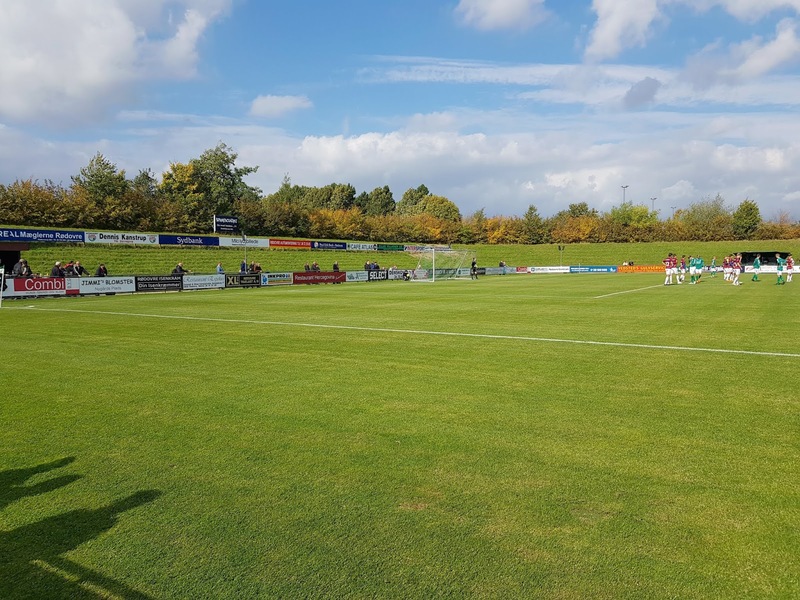 Avarta were looking to kickstart their season after a poor start had seen them lose seven of their first nine games. In comparison their opponents Frem were sitting in mid-table so were aiming to keep in the hunt for the promotion play-off places. The first half was a really poor one with no clear cut chances created by either side. The only saves required by the two keepers were easy ones from tame headers from set pieces. The second half wasn't much to write home about either though there were a handful of better chances than in the first period. In the 53rd minute Avarta's Christian Offenberg was put through on goal but his shot was saved by the visiting keeper. A couple of minutes after this another Avarta effort from the right side of the area was deflected just past the post. Frem's best opportunity came in the 66th minute when Beran Camili was sent down the left wing on a counter attack and his cross fizzed across the goal with the home goalie pushing it out for a corner. The only other item of note was Avarta being reduced to ten men in injury time when Emil Thomsen picked up a second booking. That concluded one of the dullest football matches I can ever remember seeing.